Created by bheffernan@pharos.com on Mar 27, 2019 4:46 PM. Last modified by bheffernan@pharos.com on Mar 27, 2019 4:46 PM. 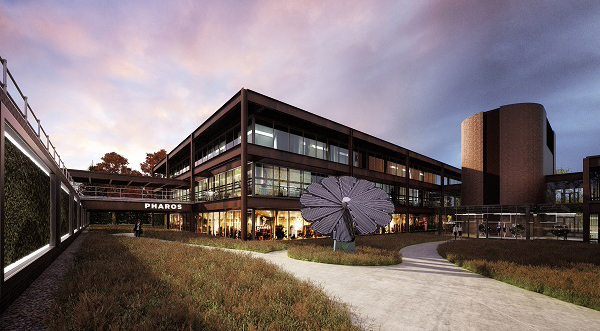 Pharos is happy to announce our move to the new Riverwood Tech Campus in Henrietta, joining other growing technology companies in a beautifully designed and environmentally conscious business complex. The unique campus and office design is quick to impress and inspire. Riverwood, originally constructed as Eastman Kodak’s Marketing Education Center in the late 1970s, was designed in the style of modernist icon Ludwig Mies van der Rohe by the architecture firm of Skidmore, Owings and Merrill (SOM). Their other work includes One World Trade Center and the Burj Khalifa—the tallest skyscraper in the world.